BuzzFeed, dubbed one of the most innovative social media businesses around by Fast Company, has launched quietly in the UK this morning. 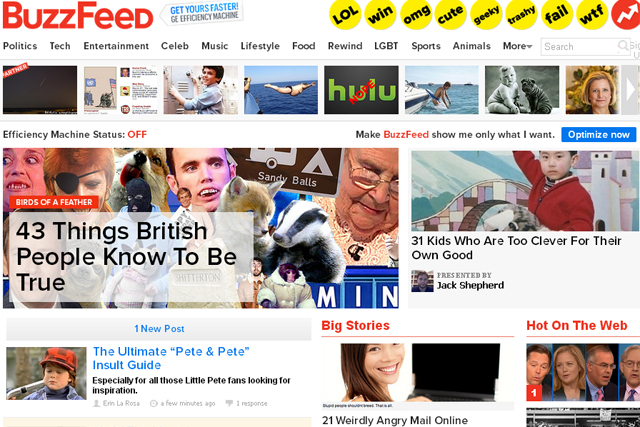 The site, famed for its memes, cats and list oriented stories, makes the UK the first country to get its own Buzzfeed site outside of the US. The UK launch has been dictated by the increasing amounts of traffic that the US site was attracting from across the Atlantic. The launch in the UK sees it lead with '43 things British People Know to be True'. Top of that list is that "The Jeremy Kyle Show attracts the best guests". Other UK centric content sure to pull in readers includes "21 Weirdly Angry Mail Online Commenters", "27 Extraordinary Facts About The London Underground" and '21 Simple Ways To Swear Like Malcolm Tucker. Continue reading this post on The Wall.